A special web book subscription with 17 poses and a new pose added each month at no extra charge. Energy work or development has been around since early human development. Ancient cultures developed methods to develop and attune themselves to not only the energy from natural sources such as the sun, but also emanating from the earth and the human body itself. The ancient cultures not only were aware of these natural energies far more than modern man as they were not inundated with modern electronics and the numerous energy waves we have created. These new waves have dulled our natural senses and are responsible for much of the stresses and illnesses we now endure. But early man did not have these disturbances and thus able to feel as well as cultivate the body’s inert energy to attune with those in the natural word. As written record is not as abundant from 11,000 years ago as it is today, much is lost to time, however what is clear is that some of these practices were drawn or carved in stone and revered in the ancient cultural artifacts. Where it originated or began to be systematized for cultivation as well as education of future generations is not clear, but the earliest archaeological evidence of Yoga's existence were found in stone seals which depict figures in Yoga Poses dated around 3000 B.C., and the substantiated origin of this art. So it is here we start with the Yogic Postures and their method of energy development, tracing through to ancient China and into the very fabric of the traditional Martial Arts we all know. At first however we should relate this to the Martial Practices, specifically those that use forms or patterns of prearranged movement sequences as these were derived from the older postures of Yoga and untold other influences. Within these postures and sequential movement from one to another lies the art of energy cultivation and flow, each with a specific reason and bio-electrical influence. After working through several of the Yoga positions and explaining each posture, it’s energetic worth and benefit for the body, we can will then work into more modern Chinese energy developing exercise and into modern times where some lost information could be sewn together with a touch of quantum physics to bring us full circle into modern times. It is then we will bring it into the Martial, Health and yes Intimacy Arts. In all of these practices and art forms there are several keys from very simple to the more complex that are inherent and similar. These keys are not limited to style because they are anatomical processes that allow you to more fully realize the energy that is already flowing through each individual in varying degrees. This energy is the electrical stimulation of the brain and nervous system as it correlates to the external vibrations or energetic manifestations all around us. Kyusho has transformed our old perceptions and has given us deeper understanding and possibility via the coordinated study of the Arts with Anatomy and Science. For example most Body Workers, Yoga or Martial Arts practitioners think of Chi, Ki or Prana when they hear the term energy. Electricians, Mechanics and Engineers will have several other definitions or a reality for what energy is. And taking it even further; Scientists, Physicists and Astronomers have yet another reality or variation of what energy is, its origin and how it moves or transfers from one location, object or form to another. We must also must acknowledge or realize that one source or type of energy transferring into another form of energy (such as electricity converting into heat), creates yet another energy form (radiance). This is true of any form or creation of it. Yet all these energies, transferences, generations and conversions have a single root that is the essence and core of all universal existence. This singular essence is the Vital Point (Kyusho), of energy development for modern society. To study Kyusho effectively one must also understand that the body is an electrical system of sorts. This includes the brain as the electrical source, the spine as a circuit breaker and the peripheral nerves as a wiring schematic. As the brain produces an electrical stimulus it is sent into the spinal nerves and then onto the specific peripheral nerves. This produces the stimulus to initiate not only muscle tension but also the functionality of the internal life support of the organs themselves. In order for the positive charge to be effective it must also have a negative as opposite polarities attract and like polarities repel. This can easily be demonstrated by holding two magnets together in a specific way. If you hold the two negative, or the two positive ends together they will form an electrical field between them and actually repel each other. Whereas if you hold a positive charged end to a negatively charged end they attract and pull together, forming a completed link. With the understanding of what Chi, Ki, Prana, etc. is, we now turn our attention to how it fits in to Martial Arts, Healing, Health Maintenance and other various applications in life. As we are able to feel the electromagnetic field and also attach and attract other peoples magnetic field we are ready to discuss how to move it first within ourselves and then in other people. Looking at ourselves as just a conduit of natural forces, we are a continually alternating with positive and negative electrical forces. The Sun and atmosphere rains down positive energy as it seeks the negative pull of the earth. The earth in turn absorbs this energy as it moves toward its core… where the negative electrical energy generated now emanates outward away from this core, the excess spewing from the two poles of north and south. Just as the earth itself, we are a constant flux of positive and negative qualities, absorbing and emitting energy and electromagnetic fields from the poles north and south as well. Did you know that the Hara is not the best or most efficient center of energy, or that storing energy is not the best for your health? This is information that is not public and why we have the private instructional course. You have a chance to see, feel and move energy like you never have before. Another reality is that with so many energy development programs to choose from, where does one even start? There is Yoga, Chi Gung, Tai Chi, Nei Gung, Wei Gung, Ba Qua and so many more. Well here is something to think about, will these above mentioned methods help you develop it so you can feel it, see it, control it and even manipulate it in others. Yes all this is possible and yes it is all possible to achieve in just a two hour session (of course not to it’s full degree). *There are so many methods of energy development in the world how do you know which one is complete, which one is better for you individually, which will bring you to your personal goals rather than simply feeling better? These are very difficult questions that can only be answered through experience with a number of methods, however, if you already have a process you feel comfortable and in sync with, then adding deeper energy work within that system would be the best idea for you. Read More.... 17 Chapters available with a new chapter added each month at no additional charge, read on any smart device, phone, pad or PC...even on your TV. 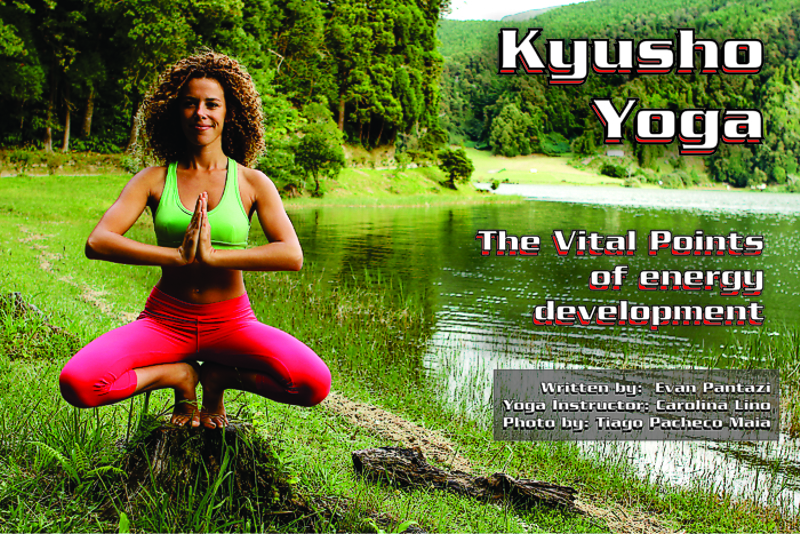 The Vital Points of energetic development and awareness in Yoga.